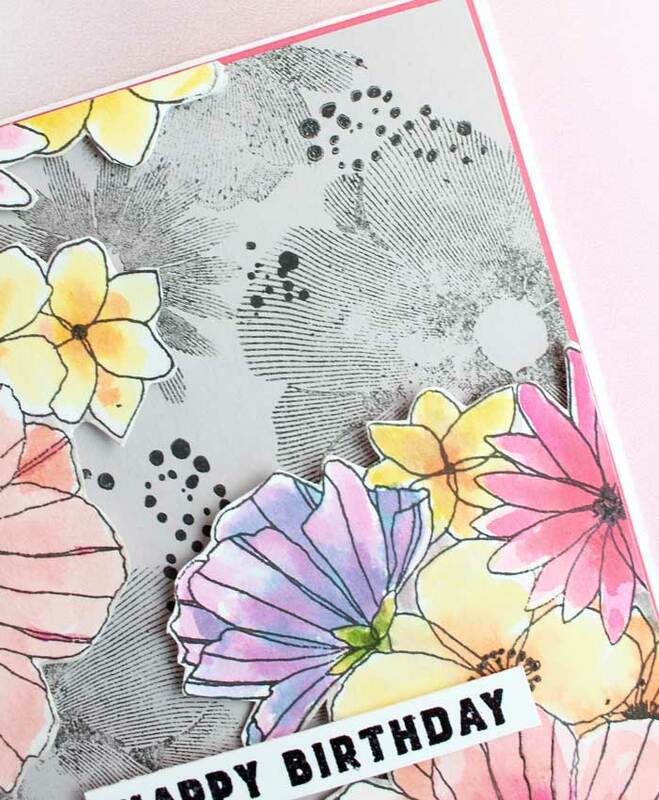 This design has a little water coloring, plus stamping. To start, I stamped, with Versafine Black Onyx ink, the cluster of flowers twice on a piece of watercolor paper. Well, I have to admit that I am a miser when it comes to using watercolor paper so I first stamped the cluster twice on a piece of scratch paper to see what sections I would use, then stamped only those sections onto the watercolor paper! Once the flowers were stamped, I set to work on coloring the flowers. I decided to channel my friend, Heather Telford here, so I used the tried and true distress stains for this. I squeezed a large dot of each of the following colors onto the Art Impressions palette board. I used Worn Lipstick, Picked Raspberry, Ripe Persimmon for the large blossoms. The centers were painted with Wild Honey, Ripe Persimmon and Black Soot. For the darker pink flowers, I used more Picked Raspberry and some Worn Lipstick. The yellow flowers were painted using Squeezed Lemonade, Wild Honey and Ripe Persimmon. Finally, the purple-blue flower was painted with Seedless Preserves, Victorian Velvet and Dusty Concord. Believe it or not, the Dusty Concord is what gave it its blueish color – a surprise to me! Then, for the greens, I went to my go-to colors: Peeled Paint, Forest Moss, and Crushed Olive. 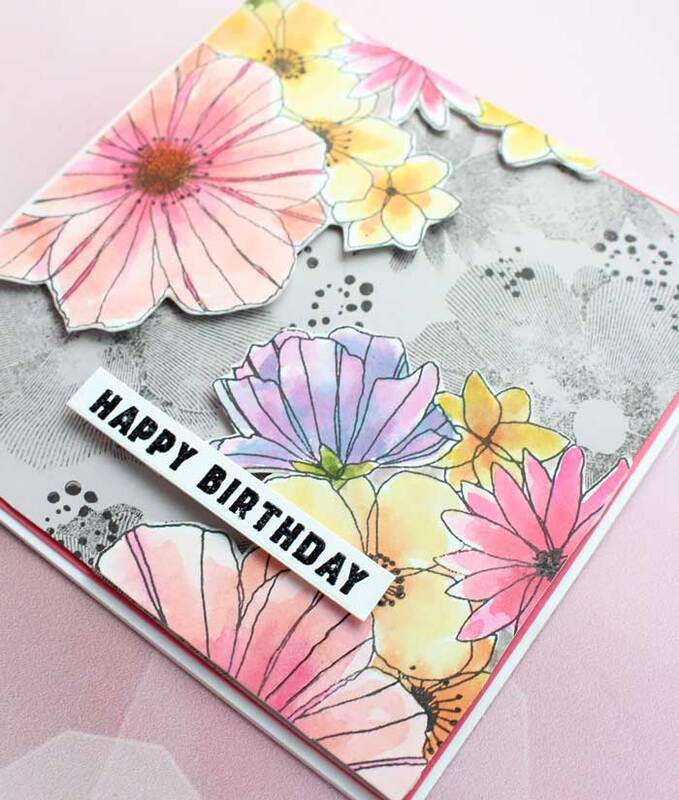 With the painting done and now dry, I trimmed the edges to form the right-angle corner for both pieces and then fussy cut around the flowers I knew I wanted to extend into the card center. I added some foam tape to the back and set them aside for a moment while I cut a square from one of my favorite colors of cardstock, Alpaca. 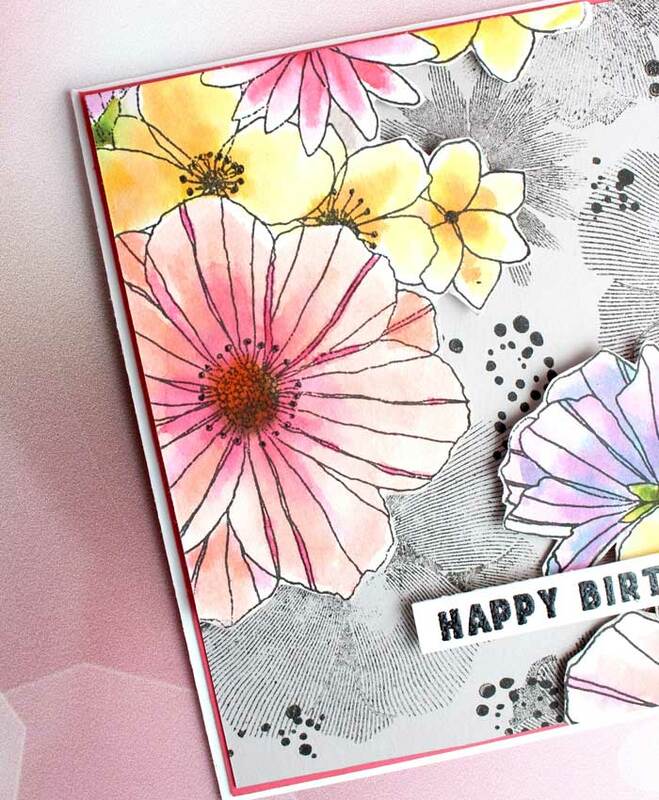 It is a gray paper but it has a faint lavender look to it too, making it perfect for this card. 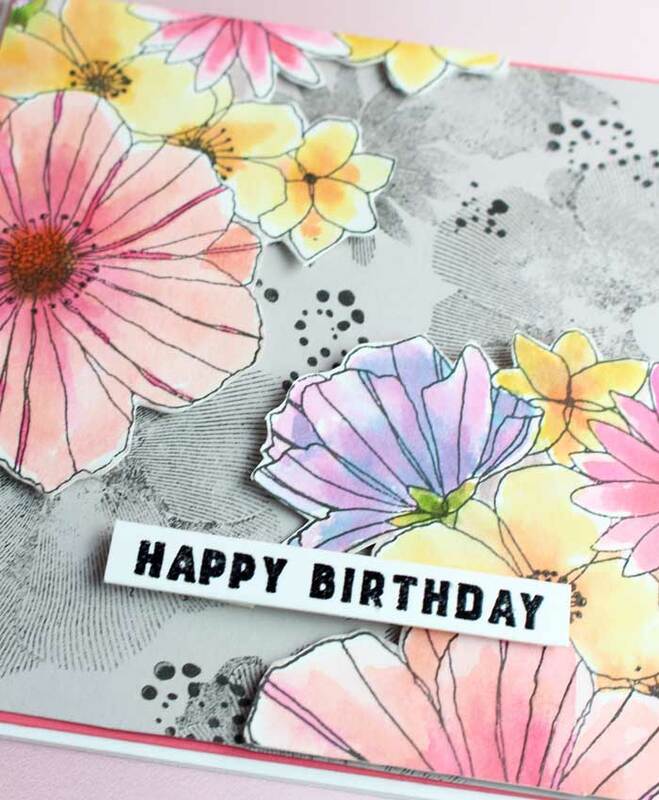 Next, I stamped each of the detailed, lined flowers randomly onto the Alpaca card stock square by first inking the stamp with Versafine Black Onyx, stamping off on a scrap piece of paper, then onto the square. This gave a muted black stamp impression. 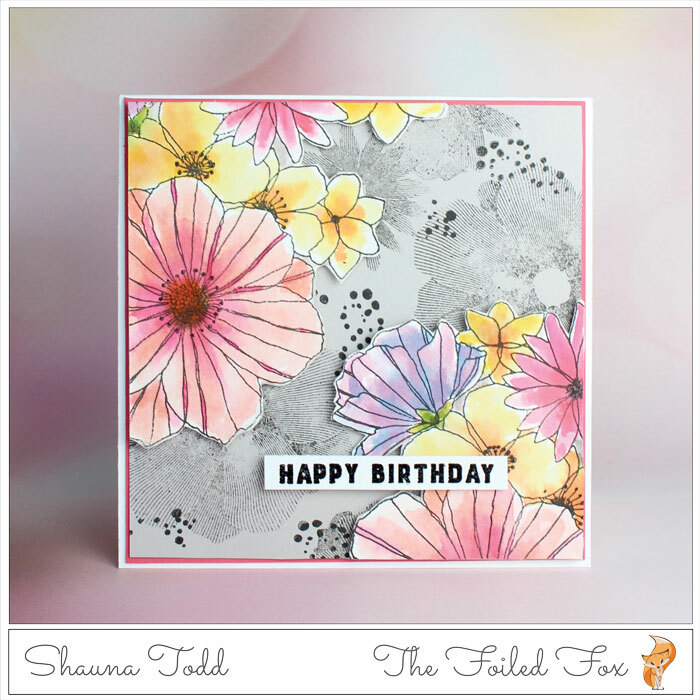 I finished off the stamping by adding ‘intentional splatters’ by using the stamp included in the set. Now, its time to assemble – YAY! I worked from the bottom up, so with a white square card base, I added a slightly smaller square of Candy Hearts pink cardstock, then added the stamped background that had been trimmed to be ever-so-slightly smaller than the pink cardstock. Next, I added the flowers by peeling off the release paper of the foam tape and pressing them into position. All I had to do now was stamp the sentiment onto a strip of white card stock using Versamark ink, sprinkle on some black embossing powder and heat set. I added the sentiment with a strip of foam tape and pressed it into place. That completes the card and it was all done with one stamp set – amazing! This card is amazing. Wow. You created a piece of art.